C.W. followed us on a vacation to Cincinnati and almost caused a riot. I was furious. First, he promised not to come but came anyway. Second, he showed at the most inopportune time. Third, he went out of his way to bust my … well, let’s just say, to irritate me. It was Derby Day in central Kentucky and while everyone was occupied, we chose to make the Kentucky Bourbon Trail with our friends, Rose and Wayne Pfirrman. Wayne and I served in the Vietnam "conflict" together and the two families swap visits each year. It was our time and we had just finished a tour of the Woodford Reserve distillery. All was going well. We slipped into the beautiful community of Versailles for lunch. All was still going well. We stopped at a restaurant called “The Grey Goose” and were enjoying Mint Juleps and the fellowship, not bothering a soul. Although the other patrons weren’t attending the big race, the ladies there donned the fancy hats that are traditional on Derby Day. Then I heard a commotion, loud voices and swearing from the outdoor patio. My blood turned the temperature of a glacier. In walked a classic redneck with an Arkansas Razorback Hog Hat perched on his head. I looked the other way but when he yelled “Hey Big Dope” across the room, I knew things were going to hell. Every head in the room snapped around. I bowed mine. He walked over and when I looked up, I saw it was worse. 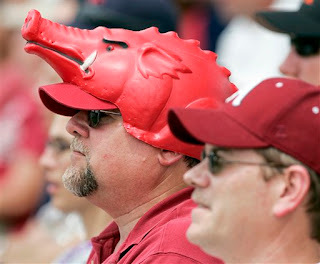 In addition to the hog hat, he wore a sweater with the words “Free Bobby Petrino” emblazoned on the front. She stabbed a morsel of food, stared hard into her plate, and didn’t say a word. My wife left for the Ladies Room. Before he could sit, though, a crowd began to gather around us. Fortunately, the manager intervened and told C.W. he had to leave. “Leave sir,” the manager said. “Wanna buy this hat?” C.W. said, looking at Wayne. Kentucky Derby. What's the big fuss about? - C.W. Rose looked up. “What was his problem?” she asked. Before I could answer, C.W. turned.